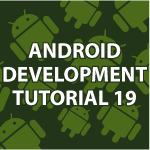 Welcome to part 19 of my Android Development tutorial. You’ll need to have seen part 18 to understand this tutorial. In this part of the tutorial I will be answering a bunch of common questions I receive. I’ll be covering how to have your app automatically change into another language ( Localization ). I’ll also show how to catch multiple events. We’ll also go over how to create a layout specific to when the app is in landscape mode. All of the code follows the video below. create a new folder in res called layout-land. the ISO country code at the end of the directory name. What part of my Android tutorial are you at?